We did not get arrested. We secured a rental car. We rolled away from Gudmont-Villiers around 10:45 am, with rain clouds threatening. As we said our farewells to the innkeeper of La Source Bleu, the resident Bernese Mountain Dog became affectionate and flopped over on his back for Steve to rub his belly (which of course, Steve did.) The big white cat, Hermes, was more standoffish but made sure that we had ample opportunity to admire him before he disappeared up the stairs. The innkeeper remarked on our colorful clothing (we were wearing RAGBRAI jerseys and rain jackets.) She was impressed with our taillights and the headlights on the bicycles, too. As we rolled out the gate of the B&B, I checked my bike computer to make sure the odometer was reset, and it displayed the message "too many signals," which I thought was about right for the inundation of new information we have been consuming. But I think it was probably just the wireless signals for the remote control of the gates to the B&B. 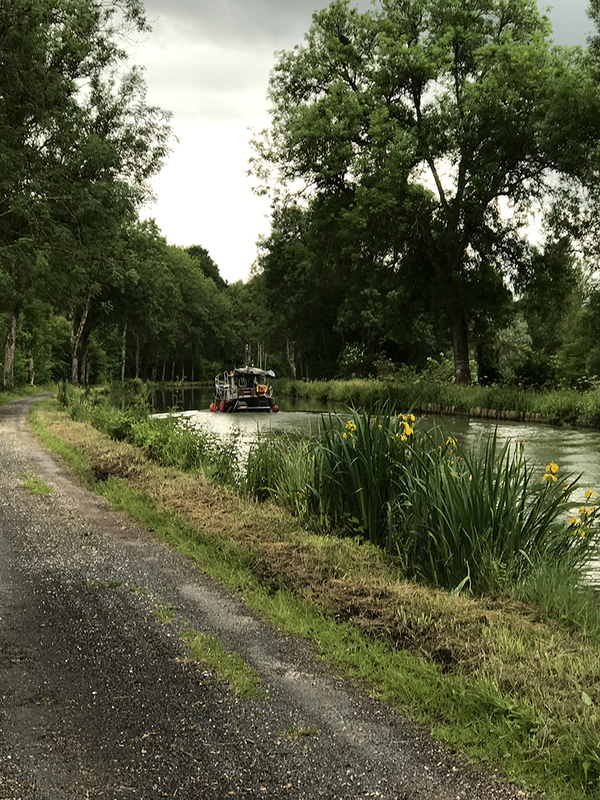 We rejoined the bike trail along the Marne lateral canal and rode along in solitude except for a boat we saw in one of the locks. It was a smaller boat, not a barge like the one we had seen earlier, so it was moving more quickly. We passed the boat (named "Stella") but it caught up with us later. We also caught up with the Belgian barge we saw the day before, and the woman on the bridge open the window and shouted a cheery greeting to us. We smiled and waved. Pretty soon, it was too warm for the rain jackets, so we took them off. 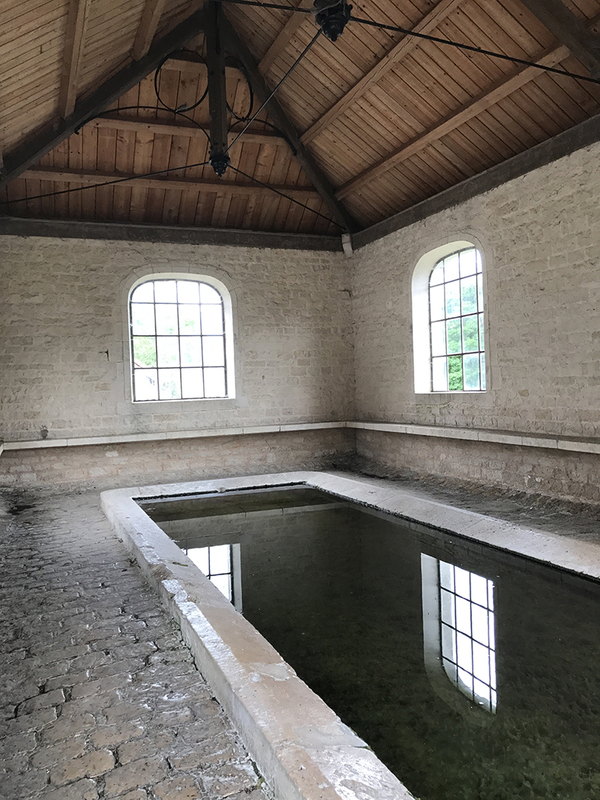 When we reached the small village of Vouécourt, we stopped to catch our breath and took pictures of their communal "lavage," which happily had some explanations in English of the tradition. While we were there, a French couple with touring bikes rolled up. We admired their gear, and I asked if I could photograph the bike and trailer because the design is unique compared to choices we have in the U.S. While we were standing there, the church bells began to ring, and I tried to get my phone out to make a brief video but was too slow. I thought I had lost the chance, but about 10 minutes later, they started ringing again, and this time, I was quick enough to catch the sound. We mounted the bikes and started off again from Vöuécourt and managed to turn down the wrong street. We realized it immediately because we could see we were on the wrong side of the canal, so Steve turned around, and as I tried to do the same, my front wheel went in some loose gravel and I took a spill. But I was very lucky because it wasn't a serious crash and there was no harm done -- to me or the bicycle. I am hoping that it is the only crash either of us has on the trip. 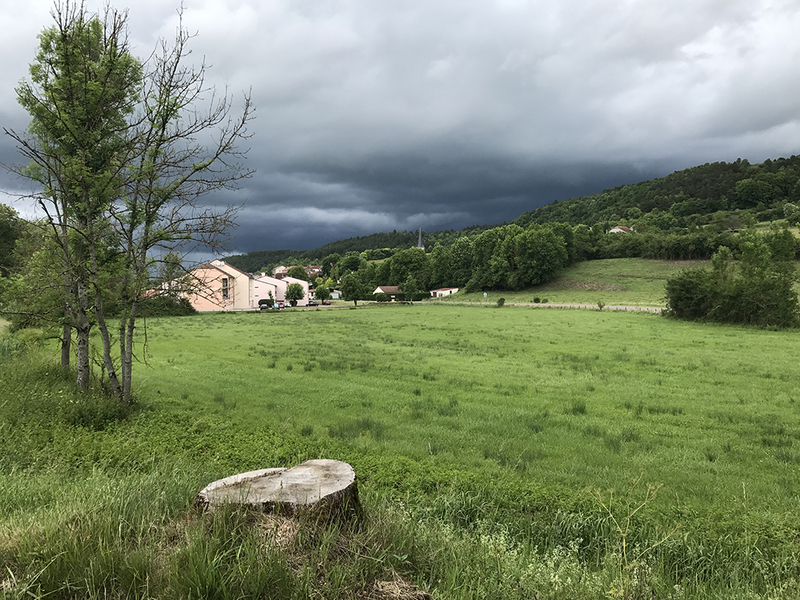 Between Vouécourt and Viéville, we were caught in a brief shower. We stopped to pull on our rain jackets and, because there was no lightning, stood under some trees until the rain stopped. A few minutes later, the sun came out and our jackets were too warm, so we stopped to take them off. We repeated this about four or five more times before the day was over. Fortunately, whenever there was a really heavy downpour, we were under the shelter of a building or awning of some sort. 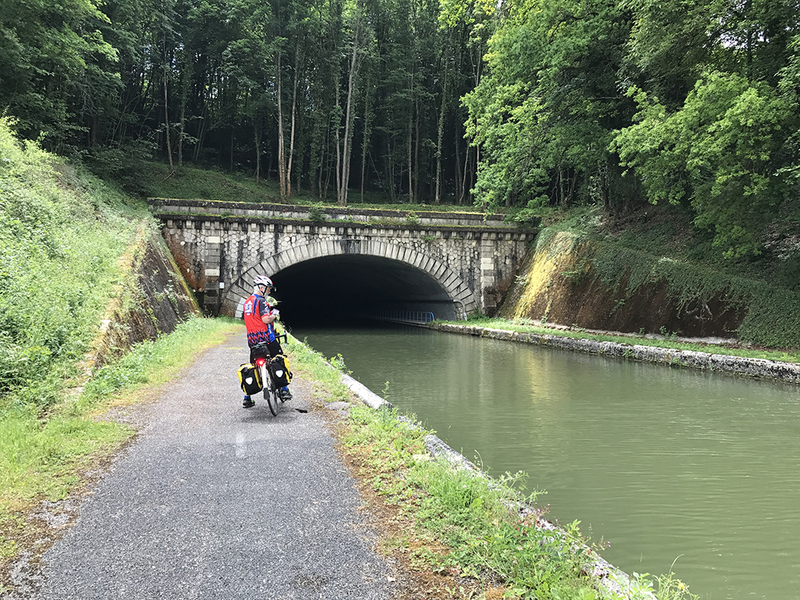 Near the village of Condes, a few miles north of Chaumont, the canal passed through a long tunnel, with the bike path alongside. I reached up to turn on my helmet light, but as we entered the tunnel, motion-detecting sensors turned on a set of overhead lights along the length of the tunnel. Just outside of the tunnel, we were expecting to change the route and make an entry on the west side of Chaumont. But we could not find the route we wanted, and we stopped to consult the map. We had met another cyclist -- who looked to be about 10 or 15 years our senior -- and he offered assistance. I used the only French sentence that I speak ("I am sorry. I do not speak French.") but it did not seem to terrify him or put him off, and I got the drift from his body language and incomprehensive (to me) French that he was willing to give it a go. It is interesting how much can be communicated between two people who do not share a common language. We managed to communicate that we were trying to get to Chaumont, and he offered to lead us there on his bicycle. So off we went -- and he pretty much left us in the dust, but we were close enough to follow. His route brought us to the eastern edge of the city, and the three of us stopped at an intersection, where he gave us directions for how we could reach the city center. I understood as much as "go up to the next intersection, turn left and then turn right," all communicated by body language and French. 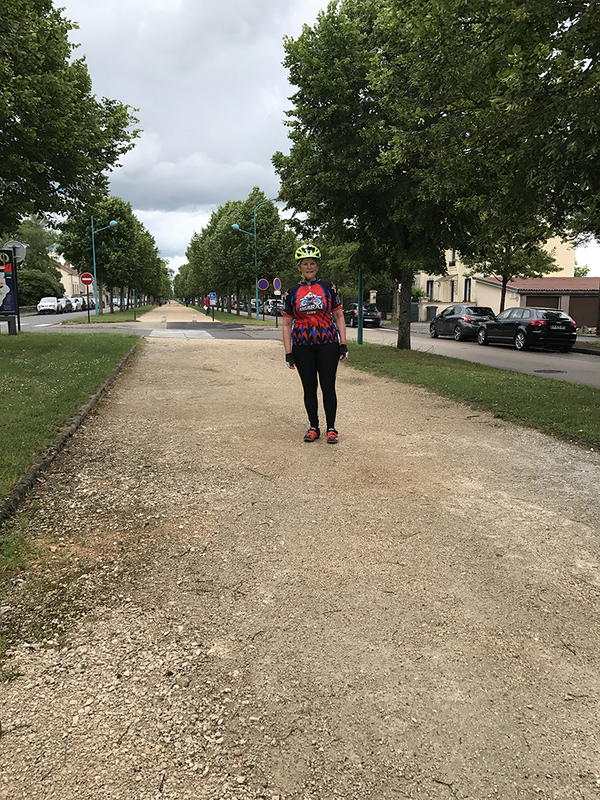 Despite going off course from our planned route to enter the city, Steve and I both thought it was cool to be led into Chaumont by a Frenchman. After the rain shower ended, we came out from under the shelter at the E.Leclerc store and started bicycling -- uphill. The AEF headquarters were on the top of a plateau at Chaumont, with the city center down below, closer to the Marne. We paused to catch our breath on the Avenue des Éstat Unis (Avenue of the United States.) When we realized where we were, I asked Steve to take a photo of me on my phone. So he set his phone on the back of his bike and used my phone to snap a couple of photos. We knew we were only a block or two from the AEF headquarters, so we started off in that direction. As we approached the site, I could hear singing. It sounded like a men's choir. I thought I was dreaming. I asked Steve if he heard it, too. "Yes," he said, "it's the cadets," and pointed toward the buildings in front of us. The site of the AEF headquarters is used today as le École de Gendarmerie (police school.) Behind the metal gates, the cadets were marching and singing in perfect unison. I rushed to catch it on video -- that's a no-no, I was quickly informed by the policeman making a beeline for me. At this point, Steve realized that he had dropped his cell phone, and he went and back to look. I asked the young guard if the two buildings (which we were not allowed to photograph) were the AEF headquarters. "This is a police school," he managed in English. "But before that?" I asked. "One hundred years ago? Were they hospitals?" He did not know. But he did confirm that they were the location of General Pershing's headquarters. "That is why we came," I said. "Merci," he replied. I really wanted to capture the beautiful sound of the voices of the cadets, but I had stopped by video as soon as I realized it was not allowed, and now the cadets had stopped singing. I waited anxiously until Steve came back, pondering that if he had really lost his phone, it would be a disaster. We have both depended on our phones to communicate, photograph, and navigate on this trip. After a few tense moments, I finally saw Steve cycling back up the Avenue des Éstat Unis, and he gave me a little thumbs-up. What a relief! He found his phone. It had fallen off his bike when he set it on the back to use my phone for a photo. Fortunately, it landed under a bench we had been sitting on, and it was still there when he went back to look. After a few minutes, another group of cadets started marching through the square, and this time, turned on my audio recording app and stuck my phone in my back pocket. At least I captured a few refrains of their voices. I don't know what song they were singing, but it was mesmerizing. Their voices were stirring. We stood and watched and listened. 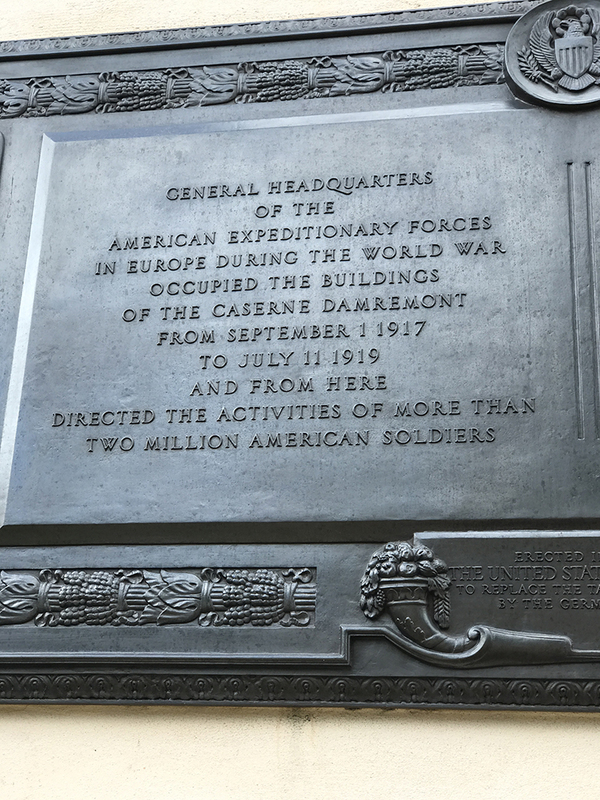 On the side of one of the buildings at the École de Gendarmerie is a bronze plaque documenting the fact that the facility was used by the AEF as its headquarters in 1917-1919. The plaque also states that it is the second one placed there, replacing the first one the Germans destroyed in 1942. When we rode away from the École de Gendarmerie, we coasted downhill toward the center of town. We were looking for a cup of coffee and the monument to French-American friendship, which we easily located in a little traffic triangle near the city hall. 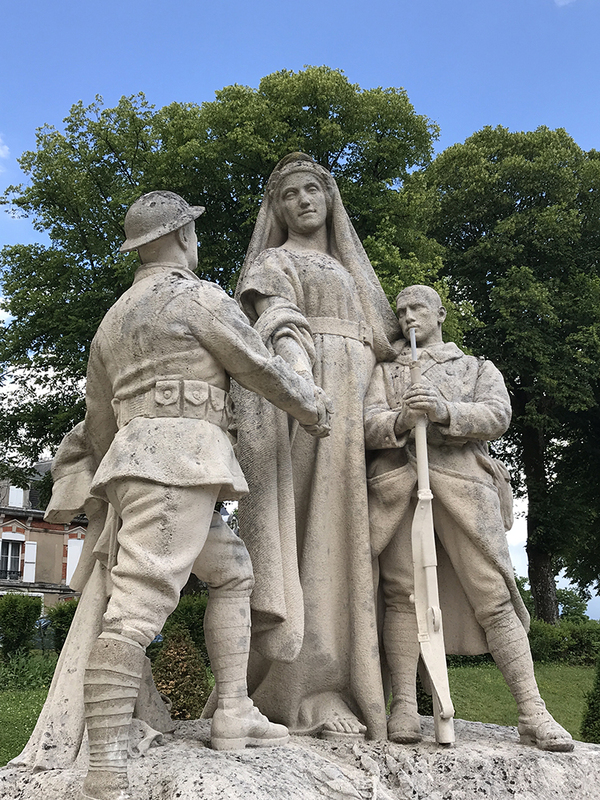 The three figures of the monument signify a poilu (French soldier), a Doughboy (American soldier) and a maternal figure (France.) The brass plaque on the base of the monument also commemorates the American Air Force pilots who died in air missions while flying from the Chaumont Air Base from 1952 to 1967. 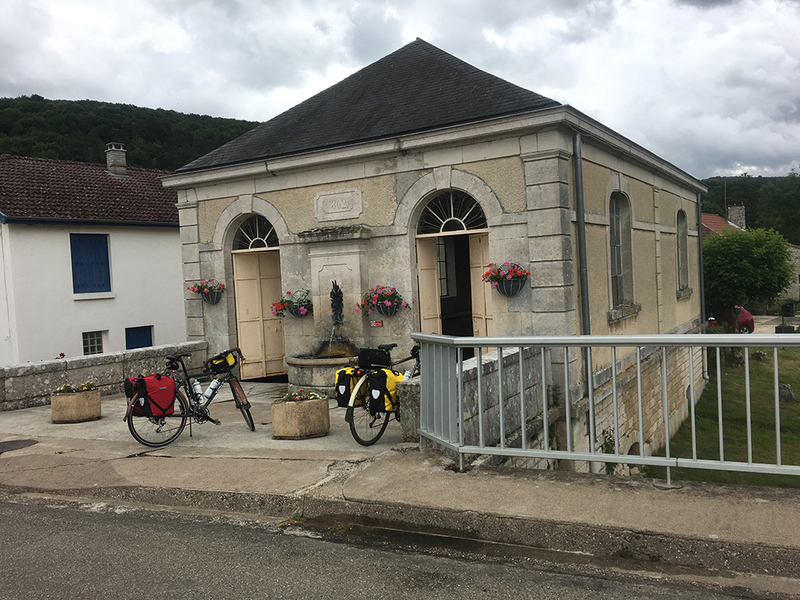 After a refreshment stop for coffee and a sandwich at Cafe Parisienne, we hopped back on our bikes and headed toward the Europcar office in the southern part of town. Here, we planned to pick up a small van that will have sufficient room for us, our bicycles and our panniers. We reached the car rental office at 2 pm and successfully completed the agreement for the car. We asked the clerk to adjust the settings on the car's GPS so that the menu and commands will be displayed in English, and after a brief rain shower during which we stepped back inside the office, we were ready to be off. But as Steve and I start breaking down the bikes to load them, we discovered one problem -- the rear hatch of the van would not open. We tried several different solutions, including looking for the child-safety switch, closing all the doors and hitting the remote key again and again, and finally, going back in the office and asking the woman there if she knows how to solve the problem. With everything fixed, we were now ready to leave the Speedy garage and go back to Europcar and get our bikes. There was just one problem -- we didn’t know our way, and the hand-drawn map is no good because of the one-way streets and additional little diversion we had to take to get to the rear of the Speedy garage. So after we fumbled with the clumsy menu on the car's GPS system, we managed to encode the destination for the Europcar location -- and it directed us to an address 10 km away, with no Europcar office anywhere in sight. We abandoned use of the car's GPS and resorted to Google Maps on Steve's phone and finally got back to the Europcar and our bikes a little before 6 pm. By the time we got to our room, we don't have time left to clean up before the restaurant closes, so we just changed out of our bicycle clothes and headed downstairs to "Floor 0" for dinner. For dinner, Steve had beef, and I had veal (for real this time -- not like the last time I was in Contrexéville and ordered what I thought was a veal dish and ended up with a plate of calf pancreas.) None of the appetizers appealed to Steve, so he just asks for a "grande salad" and ends up with a fresh green salad topped with a mustard vinaigrette and white asparagus. 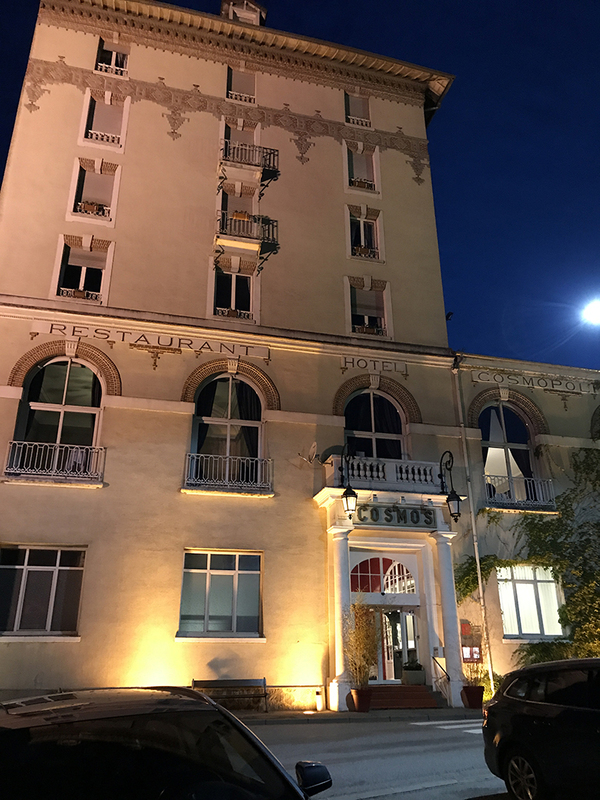 We shared a dessert of creme bruleé, finished our wine and took a short walk around the hotel. As we headed back to our room, we noticed an old framed print on the wall with a line drawing of an early (ca. 1904) floor plan. It was interesting that the rooms had private bathrooms even 100+ years ago. Before we headed upstairs to our room, we stopped at the bar and got two cognacs. We look forward to more adventures tomorrow. There really are boats (and fish) on/in the Marne canal. The church bells will always ring again. Forego the foie de gras and ask for the grande salad.